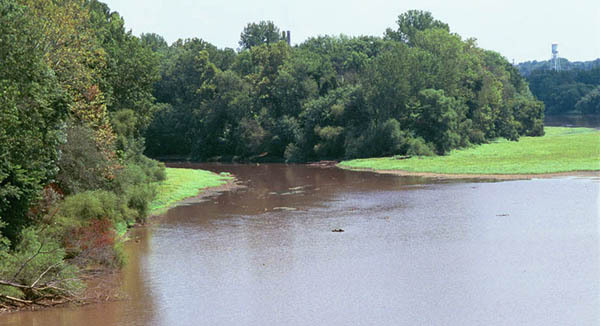 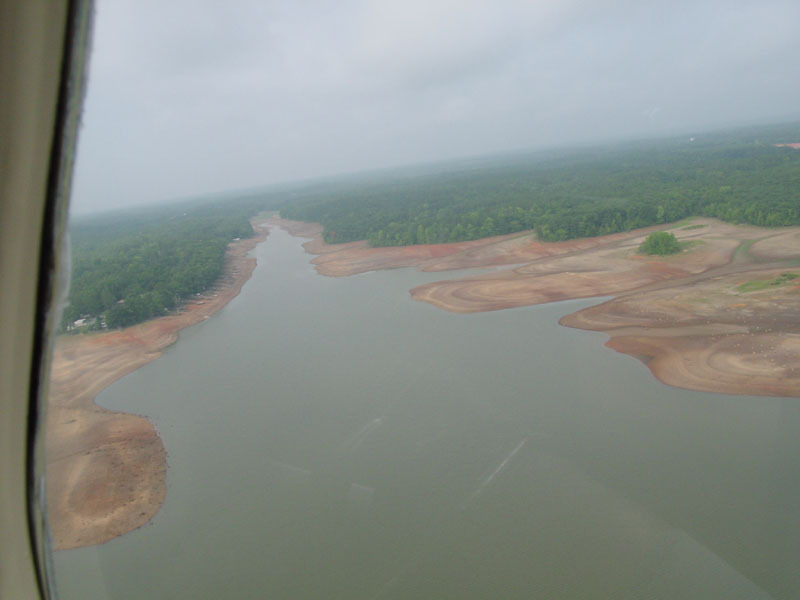 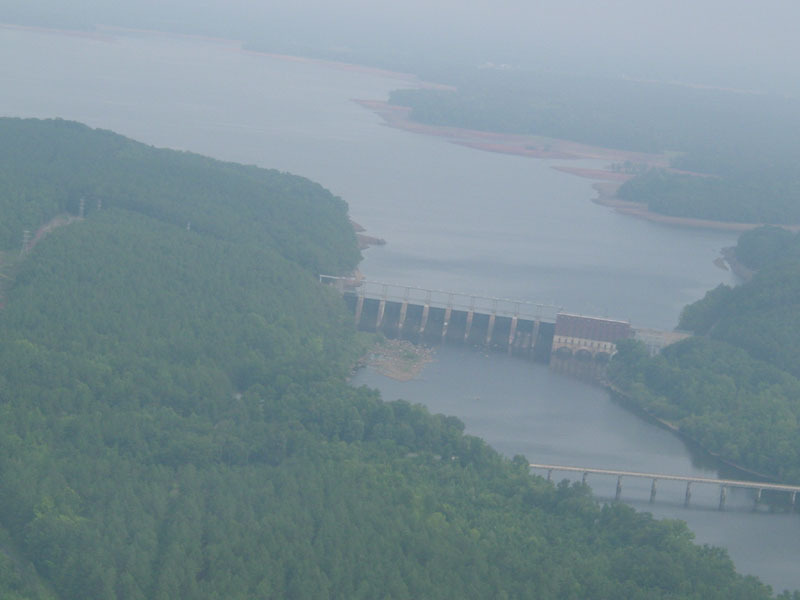 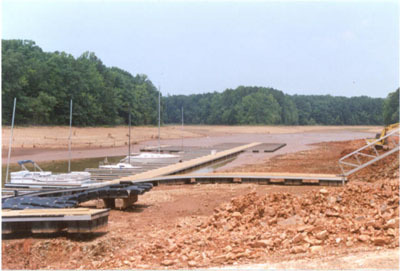 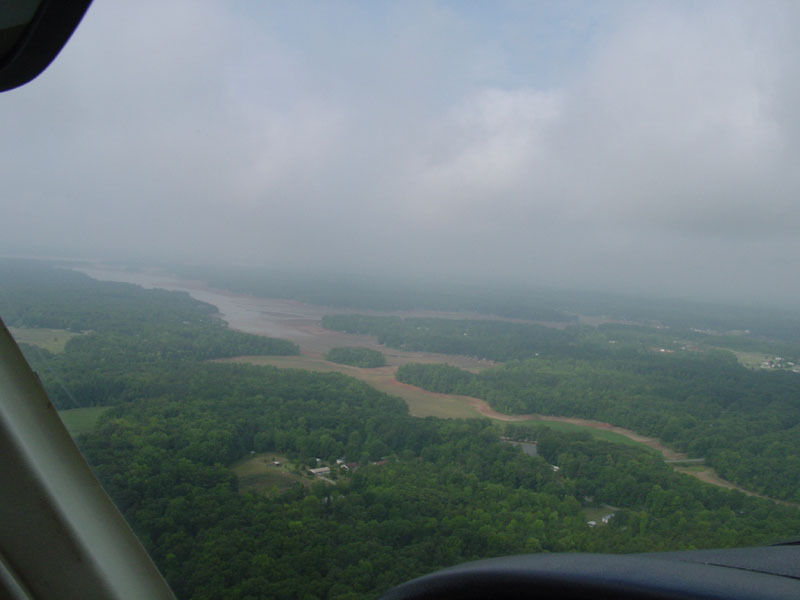 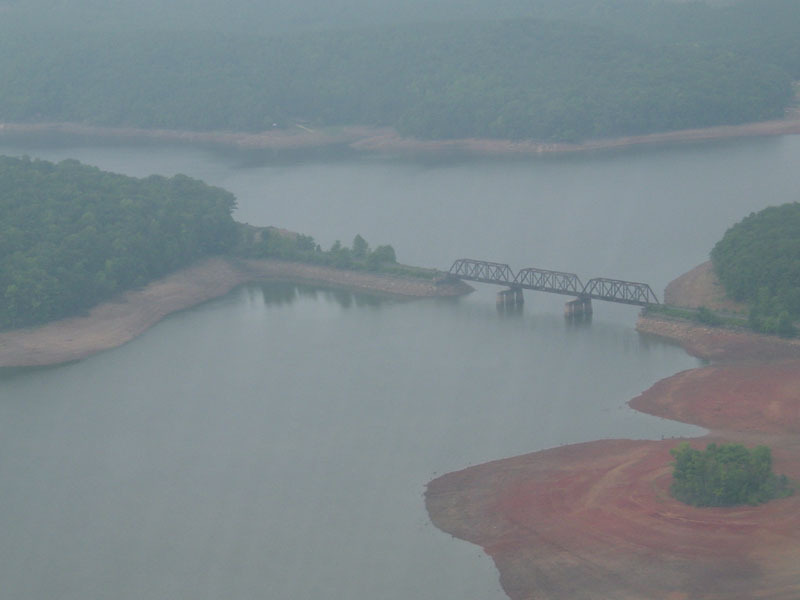 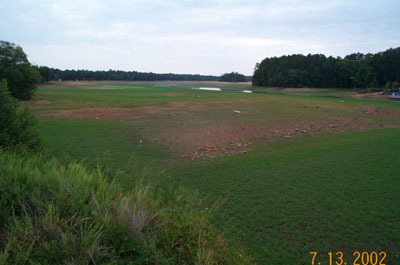 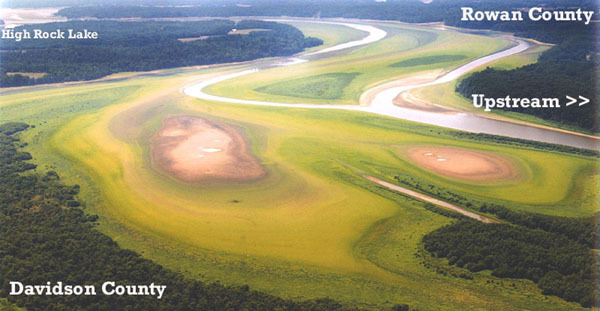 Due to dry weather patterns in 2002, High Rock lake and other lakes on the Yadkin River chain suffered very low water conditions. 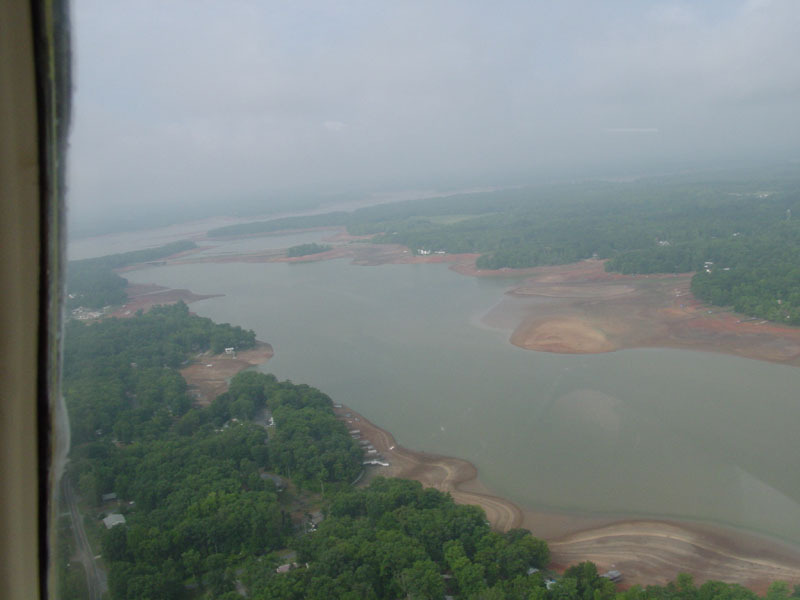 With the resent rains our lakes are back to normal. 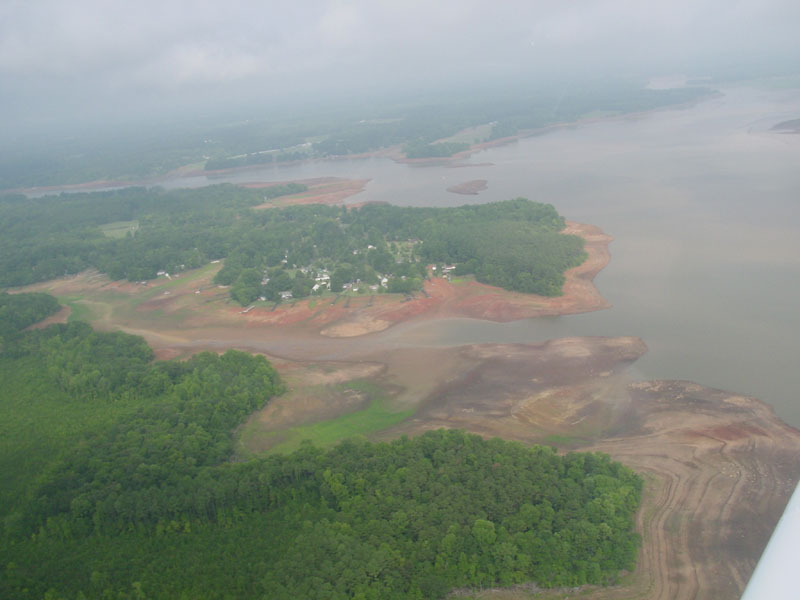 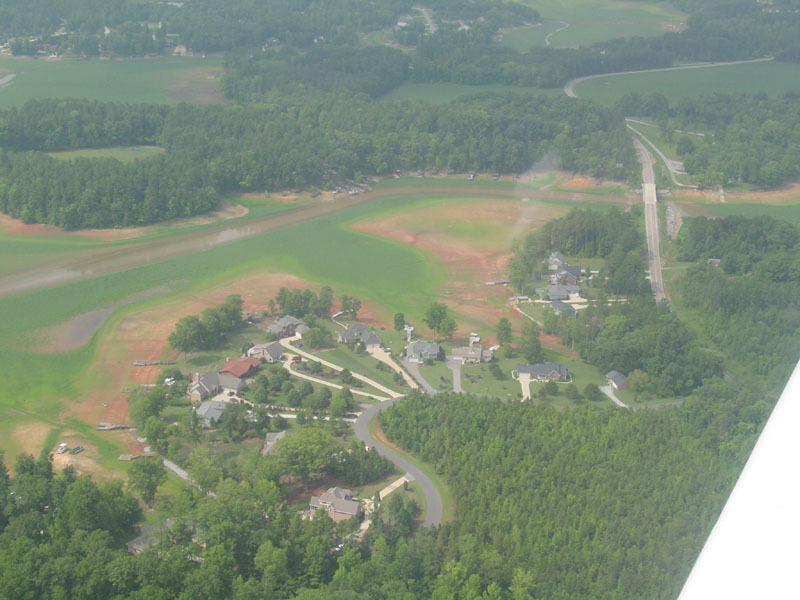 Picture above by Tom Truell of Kernersville, NC Aerial photo over High Rock Lake. 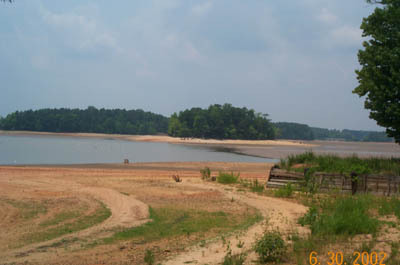 Right side of photo appears to be top of picture. 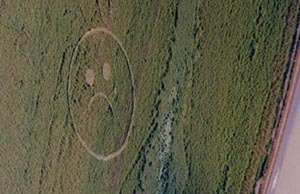 Someone has done damage to ALCOA property by mowing a sad face in the landscape. 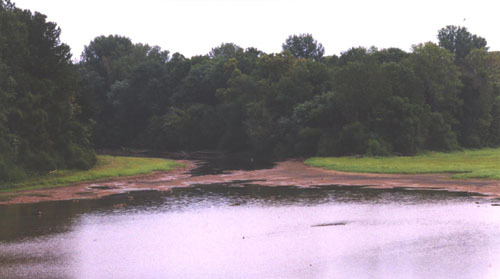 Looking upstream from Hwy. 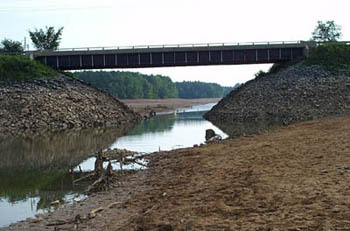 29 bridge at Spencer, NC. 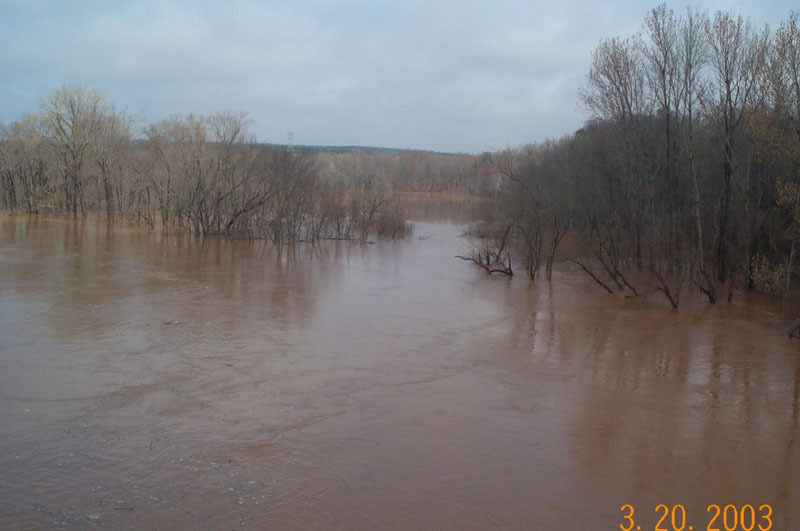 This is main channel of Yadkin River about 2 miles above High Rock Lake. 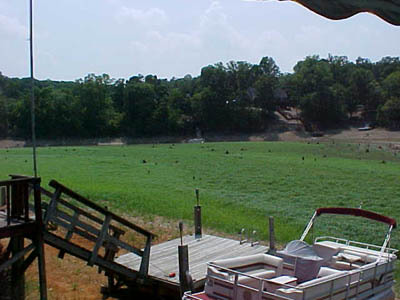 The York Hill boat landing is just to the right of this picture. 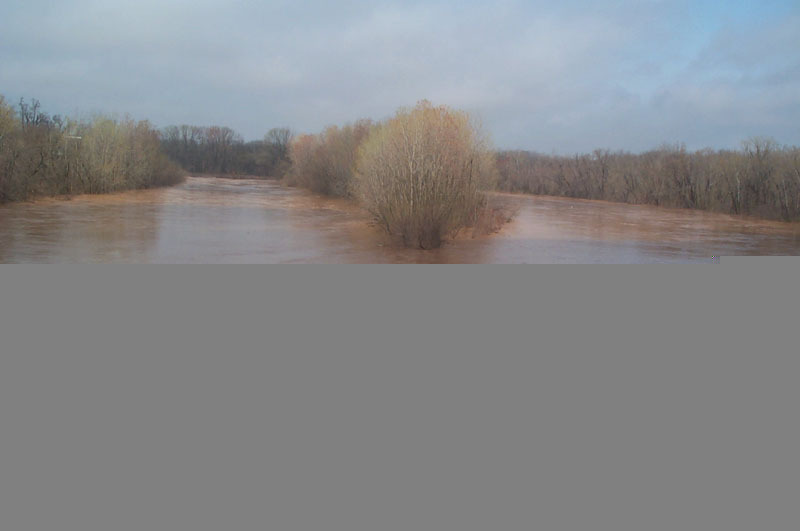 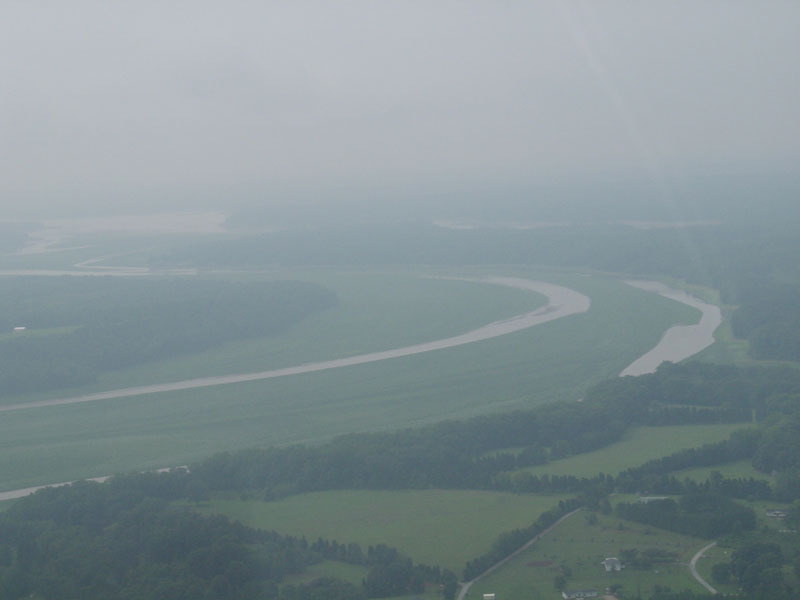 Below four pictures are main channel of Yadkin River from I-85 bridge at Spencer, NC. 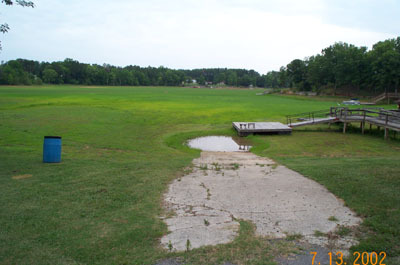 All three pictures are the same location. 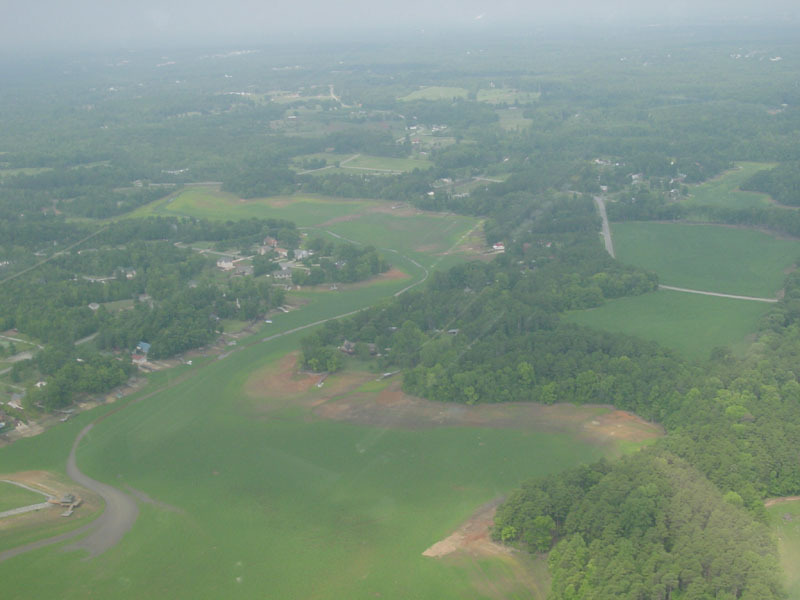 Look closely at top picture above tree line on left. 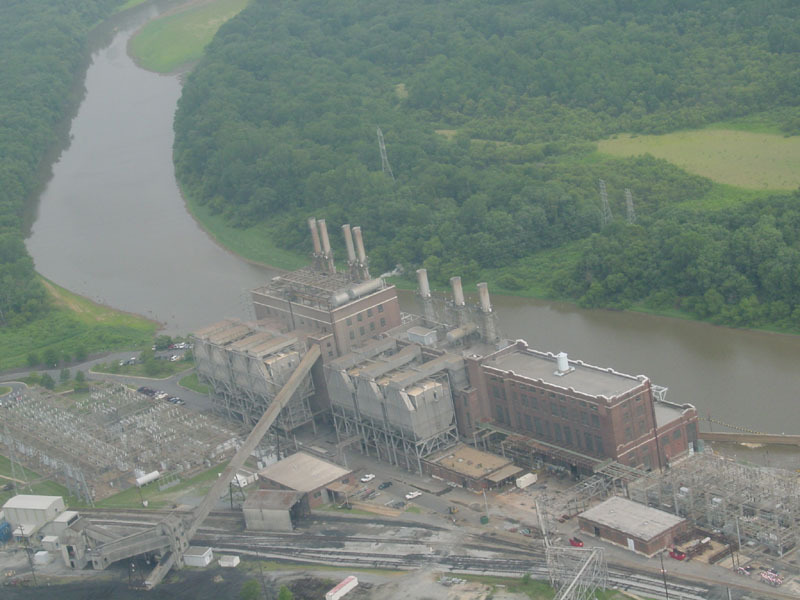 You can barely see the top of smoke stacks Duke Power Company, of Buck Stream Station. 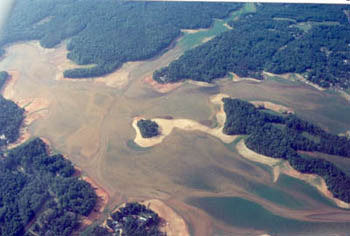 Large green sandbar is normally 8 to 9 feet below surface. 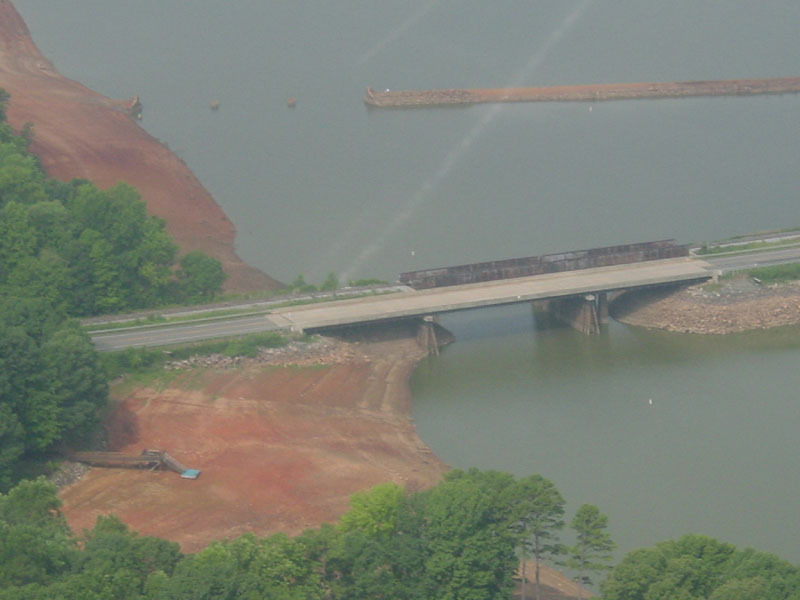 I-85 looking downstream left leg of water and is called the "old River channel." 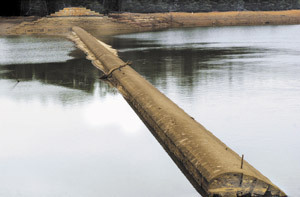 These 2 water ways come back together just below the steam station. 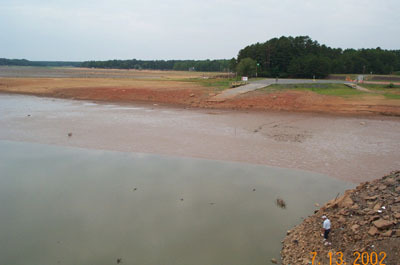 I-85 looking downstream Same location but a week later and less water. 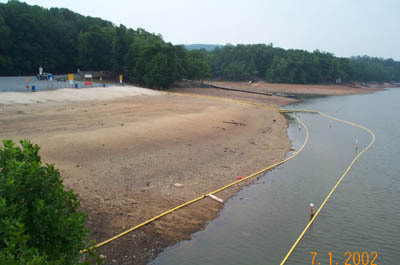 Does this picture give you a sense of what the animal life is going through on Badin and other lakes? 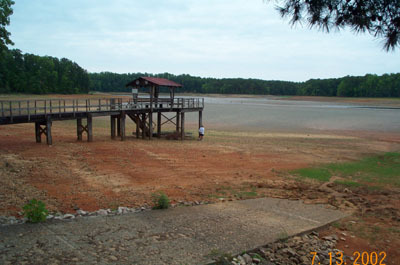 This picture taken on August 15th. 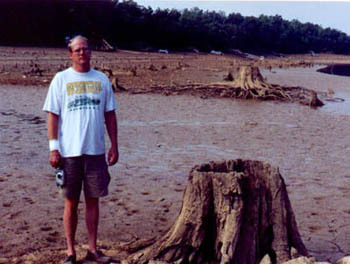 on Badin Lake 100 feet from shore. 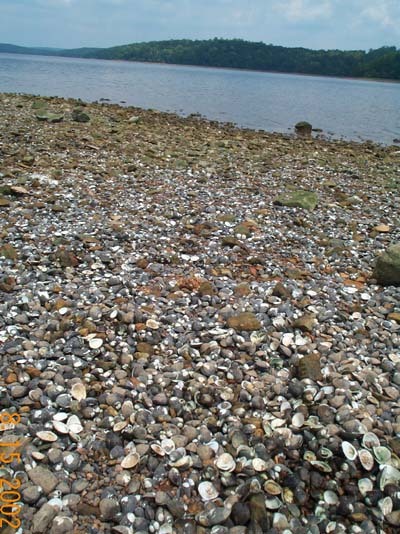 The stench is great from the decaying of Tiger Mussels. 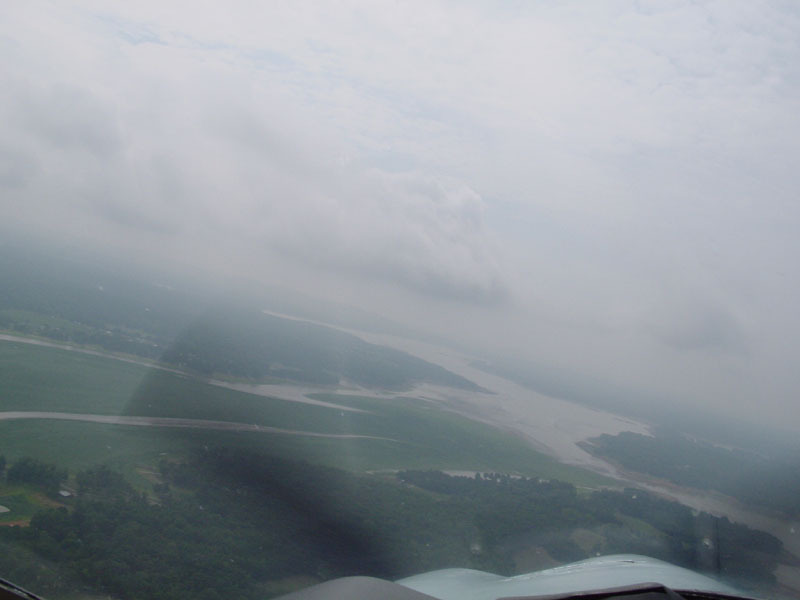 From same point as above, this picture is looking more toward main channel of river. 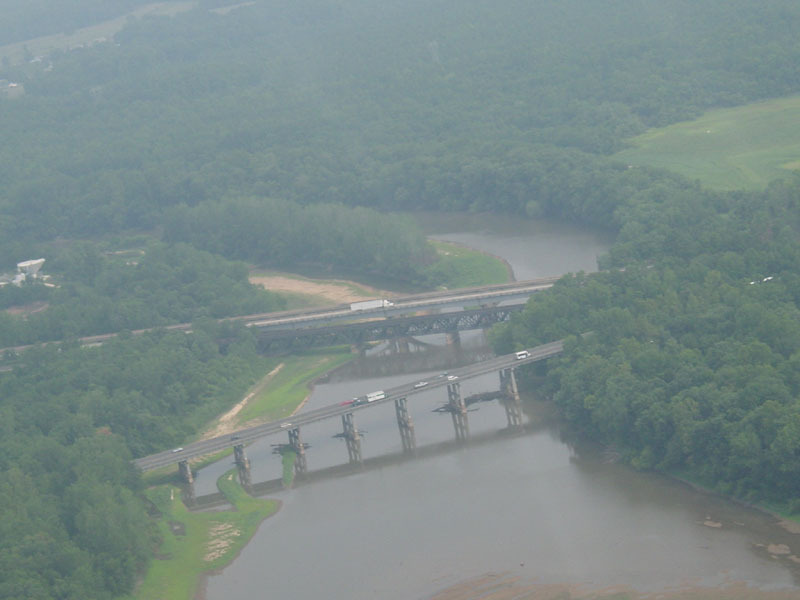 Lighter gray is muck. 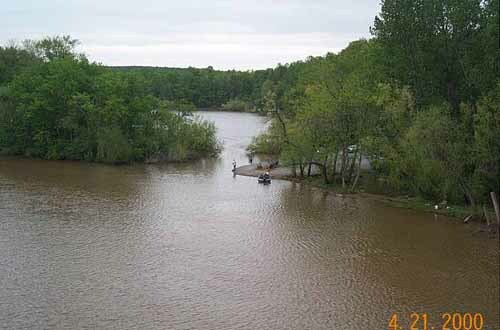 Mr. Hilliard who owns the property below told me today that 40 years ago at full pond the creek channel in front of his pier was 28 feet deep. 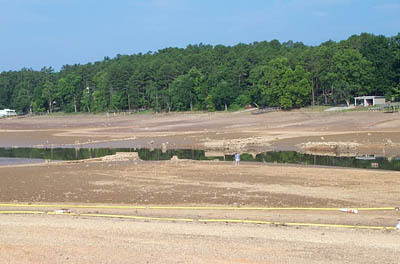 With a lake draw down now of 20 feet there is a mud bottom. 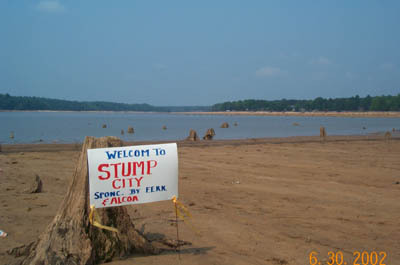 8 feet of silt and mud. 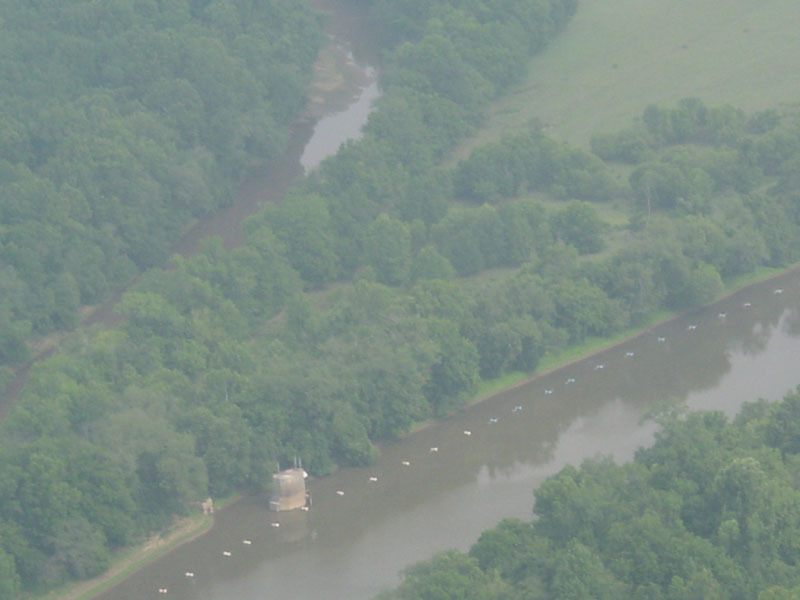 View from High Rock Boat & Ski Club Be advised, you may launch boat but you can't go far.